My roommate Shane and I are typical bachelors in many ways. I’ve got a Superman poster in my bedroom. Shane’s got a bunch of Star Wars toys in his. The furniture in our place is a mishmash of used pieces, chosen for utility and convenience over what’s stylish or “in”. You’ll find a stack of comic books behind the toilet in our bathroom. Our meals aren’t exactly Martha Stewart-approved either. Shane recently had cottage cheese, celery, cucumber slices, peanut butter toast and yogurt for supper one night. I had a hardboiled egg with a side of broccoli, carrots and some cold brown beans. 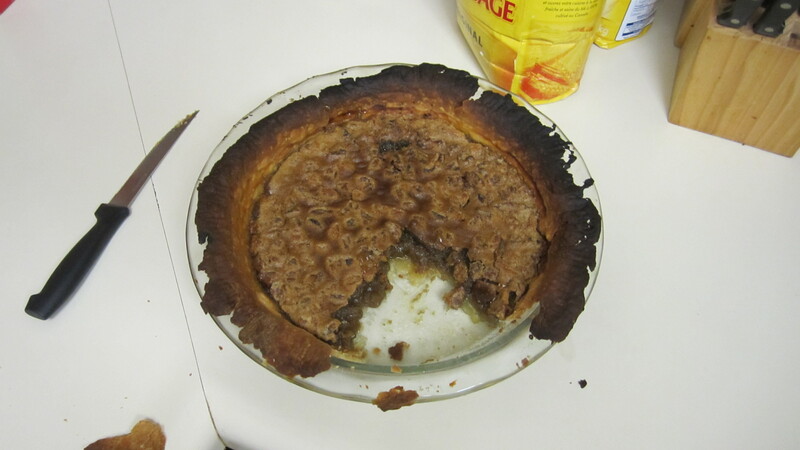 So I was surprised and impressed when Shane tried to get domestic and make a pie from scratch this past weekend. He’d been thinking about it and planning it for quite a while. His mom got him a brand new pie plate and a pie cookbook for his birthday this year. He hummed and hawed for a long time, trying to figure out which pie he wanted to make. He finally landed on a maple-walnut pie. I was rooting for rhubarb or cherry but this was his baby so I didn’t fight him on it. Turns out our oven is actually a portal to the surface of the sun. As a result if you leave anything in there for more than a moment, it’ll burn to a crisp. Of course, had we been in the habit of using the oven more instead of eating toast and cottage cheese for supper, we may have known this. Life is full of curveballs. External factors outside our control can derail even the best-laid plans. Shane did everything right but in the end was foiled by an appliance on the fritz. I’m sure my friend Julie who manages a golf course can also attest to this fact. She can have a big tournament organized and planned to the finest detail. But she can’t keep those skies from opening up and stop the rain from coming. Homelessness is one example. Assuming that a homeless person should just stop being lazy, pull his socks up and get a job is unfair. 9 times out of 10 (hell, 10 times out of 10) there are external factors at play (be it mental health, addictions, the economy, etc.) that we should be sensitive to that need to be addressed. As a former project manager and a bit of a control freak, I know these external wild cards can really ruin a person’s day. The best you can do is accept that something unexpected can and usually does happen, have a plan B, be quick on your feet to adapt your new reality and make any changes you can to reduce the chances of it happening again (like getting our oven fixed… or just sticking with the store-bought pies). What do you think? Do you have examples of how life throwing curveballs at you? This entry was posted in Life Lessons and tagged advice, humor, humour, lessons, life, minimalism, simple living, simplicity, slowing down. Bookmark the permalink. We still have an entire pie in the fridge, minus one slice.